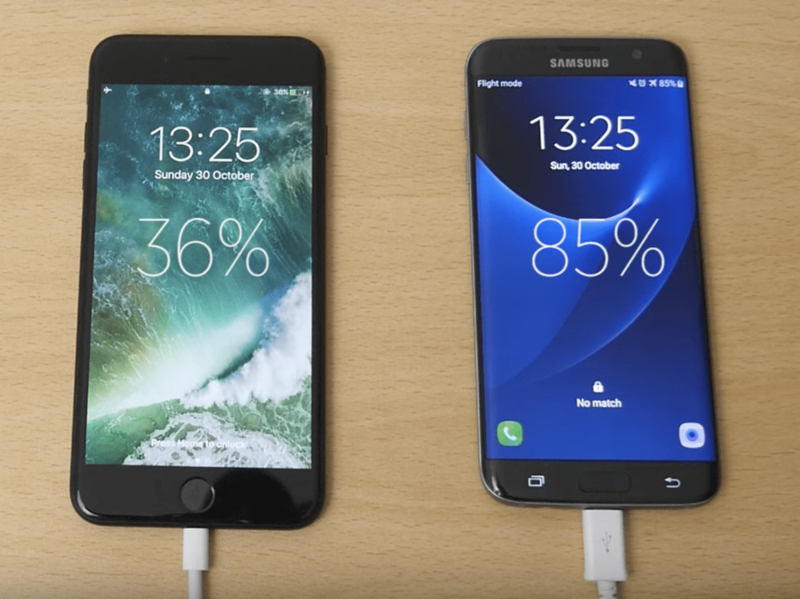 Have you noticed Apple’s IPhone doesn’t charge as fast as Android phones? Here are some major reasons. One of the key features that Android users like to boast about to their iPhone-toting friends is "quick charging," and it's certainly a boast-worthy trait. In a video on YouTube, an iPhone7 Plus took an entire hour longer to charge from zero to 100% than a Galaxy S8+. You might have noticed the word "Quick Charge" inscribed on an Android phones charger or other indications on the smartphone (Android) marketing materials. The "Quick Charge" is a technology that was developed by chip maker Qualcomm, which the company adds to certain models of its chips. Qualcomm's Quick Charge tech is different from regular charging in that it uses a different combination of voltage and amps to provide a higher wattage – and therefore faster charging. Whereas the iPhone's regular charger outputs 5 volts at 1 amp for a total of 5 watts, a Quick Charger can output 9 volts at 1.67 amps, making for 15 watts. Some quick chargers even go up to 12 volts at 1.67 amps, making for a fast 20 watts which is incredibly fast for a mobile device. A lot of Android phones manufacturers make use of the Qualcomm chips to induce Quick Charging technology. Only certain models of Qualcomm's Snapdragon processors support Quick Charge, and those processors are usually the higher-end chips that you'd find on premium flagship devices. Qualcomm has a list of phones that come with Quick Charge chips. Apple's iPhones don't have Qualcomm's Quick Charge feature because they don't run on Qualcomm chips. They run on Apple's own "A" chips, like the iPhone 7's A10 chip. However, not all Android phones with the Qualcomm chips have fast charging. An iPad charger outputs 5.1 volts at 2.1 amps, which makes for a 10 watt output that's faster than the iPhone charger's 5 watts. Still, it's not as fast as a Quick Charger's 15-20 watts. Apple will eventually have to develop its own Quick Charging technology if it continues to use the “A” chips. It's possible to charge an iPhone faster with an iPad charger than using the included iPhone charger, but it's still not as fast as Qualcomm's Quick Charge. Hopefully, Apple will feature the Quick Charge tech on its upcoming phones.